Now researchers at the U.S. Department of Energy's Lawrence Berkeley National Laboratory (Berkeley Lab) and the Joint Center for Artificial Photosynthesis (JCAP), a DOE Energy Innovation Hub, have come up with a new recipe for renewable fuels that could bypass the limitations in current materials: an artificial photosynthesis device called a "hybrid photoelectrochemical and voltaic (HPEV) cell" that turns sunlight and water into not just one, but two types of energy – hydrogen fuel and electricity. The paper describing this work was published on Oct. 29 in Nature Materials. 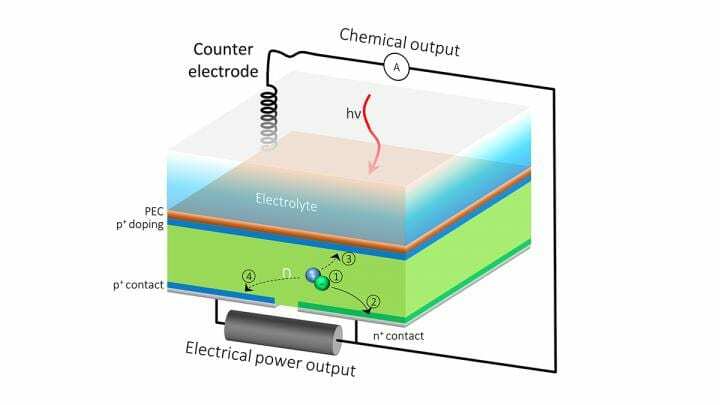 The current passing through the device is limited by other materials in the stack that don't perform as well as silicon, and as a result, the system produces much less current than it could – and the less current it generates, the less solar fuel it can produce. So Segev and his co-authors – Jeffrey W. Beeman, a JCAP researcher in Berkeley Lab's Chemical Sciences Division, and former Berkeley Lab and JCAP researchers Jeffery Greenblatt, who now heads the Bay Area-based technology consultancy Emerging Futures LLC, and Ian Sharp, now a professor of experimental semiconductor physics at the Technical University of Munich in Germany – proposed a surprisingly simple solution to a complex problem.